In the next sections, we will examine the bull case for gold and the risks facing it. In conclusion, we will try to answer the following question: Is this the beginning of a new golden age? In the latest Barron’s Big Money Poll, only 3% of respondents thought that gold was the most attractive asset class. Moreover, 71% were bearish on the yellow metal. Volume traded in $GLD (the SPDR Gold Trust ETF) has come down dramatically, which indicates a lack of interest in gold bullion. Volume traded in $GDX (miners) and $GDXJ (junior miners) has been increasing; however, interest in “gold mining stocks” has been falling since mid-2011. This suggests that traders are trying to catch the falling knife, even though investors are not convinced that gold is undervalued. Even at higher prices, gold miners will be unable to replace all of their depleting reserves. Also, it will be very expensive for them to bring new projects online. Lastly, it is important to note that major gold discoveries have become scarce. These trends are negative for supply and positive for prices. On the demand side, Asia and Europe should continue to support the market. Total bar and coin demand (in tonnes) increased 33% YoY from Q3’14 to Q3’15. Furthermore, consumer demand was up across the board, with exceptionally big numbers in the US. According to the World Gold Council (WGC), “coin sales by the US mint during the quarter were on par with that of Q4 2008.” Another key source of demand is central banks. They have continued to buy as they look to diversify their reserve assets. This speaks to gold’s utility as a portfolio diversifier. Total demand has been falling; however, the quarterly numbers suggest it could be stabilizing. Going forward, consumer demand is likely to offset ETF outflows. Gold is a big part of both India’s and China’s culture. As such, it is likely that demand will remain strong. There is an interesting divergence taking place in the physical gold market. China’s demand numbers, as measured by withdrawals from the Shanghai Gold Exchange (SGE) are much higher than those reported by the World Gold Council (WGC). 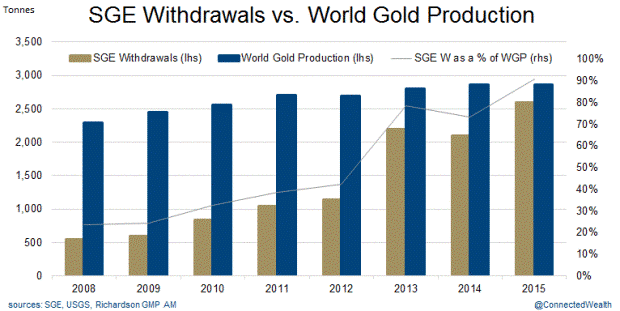 SGE withdrawals exceeded the WGC’s demand estimates by 3,193 tonnes from 2007 to 2014. 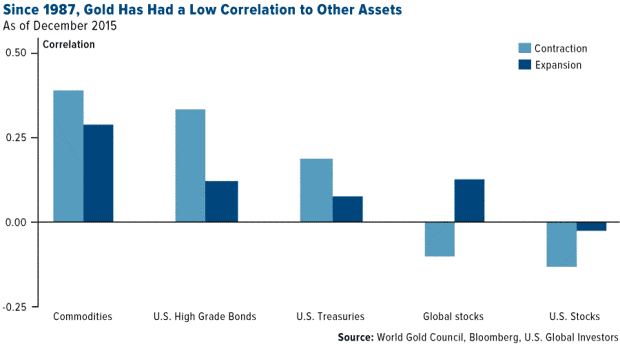 As a result, gold tends to rise when stocks fall, which is good for portfolio diversification. Gold is also an FX hedge for foreign investors. In 2015, it performed relatively well in non-dollar currencies such as the Brazilian Real, the Russian Ruble, the Chinese Yuan and the Canadian dollar. 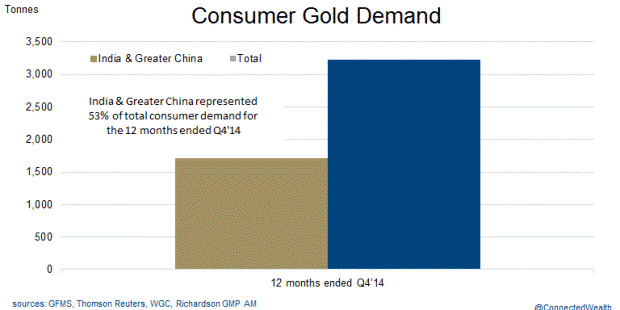 This is important because non-US countries are the main consumers of gold. Loose monetary policy is here to stay. This cycle, every central bank that tried to raise rates has had to reverse course. That is bad for currencies and good for gold, since no one controls its supply. Gold can also protect us against a rising cost of living because it tends to hold its value over time. If you look at the CPI then inflation seems relatively low. That said, the CPI is a utility index, not a measure of the cost of living. Most people would agree that cost of living is rising. For example, education and medical care costs have been outpacing the CPI for years. Typically, the US dollar index and gold are negatively correlated. Said differently, when the dollar index does up, gold goes down. Even so, last year, the US dollar (USD) influenced gold prices more than it usually does. In 2015, the correlation between the two was -0.50 in 2015, much higher than -0.36, which is the 30-year average. Going forward, it’s likely that the correlation between gold and the USD will revert back to normal. An additional concern is rising rates. One may assume that higher interest rates are good for the dollar. Actually, that is not the case. Historically, the dollar has stopped appreciating when the US raised rates. If the USD index has peaked then that would be good for gold prices. Despite the fed’s intentions, the yield curve (2s10s) has flattened to its lowest levels of the expansion. The short end has increased but the long end, which is driven by growth expectations, has not. Basically, the market is not convinced that the era of low rates is over. Even if rates do increase, gold may perform well. According to Sundial Capital Research, gold actually does quite well in rising rate environments. Gold prices increased by an average of 25.2% in each of the rising rate environments from Dec31’76 to Dec27’13. The median gain was 5.2%, which is much less impressive but still positive. Low rates are probably better for gold than high ones. That said, it may show good returns either way. In the US, the paper gold market is much bigger than the physical one is. In other words, many contracts are traded but not much gold changes hands. The level of gold dilution has reached unprecedented levels. In a recent blog post, zerohedge showed that there are 40 million ounces worth of open interest but only 74 thousand ounces of registered gold at the Comex. This works out to a gold cover ratio (open interest/registered gold) of 542! The takeaway point is that the amount of gold that is traded is much greater than the amount that actually exists. The downside risk is that supply in the futures market overshadows demand in the physical market, thereby weighing on prices. Still, there is an upside risk. If demand for physical gold remains strong and inventories continue to fall then then the Comex may run out of supply. If that happens then gold prices will rise as market participants start to question the divergence between the paper and physical markets. Sign up for our daily newsletter called the Daily Shot. It's a quick graphical summary of topics covered here and on Twitter (see overview). Emails are NEVER sold or otherwise shared with anyone. From our sponsor, Fitch Solutions: Sign-up for Inside Credit - a weekly wrap-up of noteworthy Fitch content delivered every Friday.